Walden Pond Press, 9780062327475, 400pp. 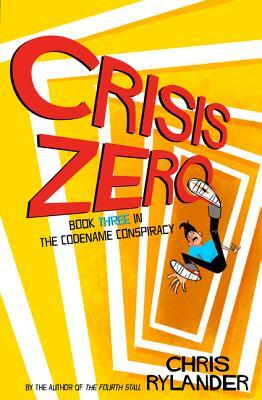 From Chris Rylander, author of the breakout hit Fourth Stall saga, comes the third book in the Codename Conspiracy series—an incredibly funny and clever mash-up of middle grade school story and spy adventure, perfect for fans of Gordon Korman. Carson Fender, aka the retired Prank Master, aka Agent Zero, aka the all-in-one World's Greatest Hero and World's Greatest Screwup, must protect this program, codenamed Exodus. He is paired once again with his best friend, Danielle, aka Agent Atlas. Together, they must expose an enemy agent working from inside their school—an enemy agent with the mandate to stop at nothing to help secure Exodus. Can Zero and Atlas foil this enemy before it is too late? Carson's final mission will test his loyalty, smarts, and courage as never before. Chris Rylander is the author of the Codename Conspiracy series and the Fourth Stall saga. A fan of chocolate, chips, and chocolate chips, he lives in Chicago. You can visit him online at www.chrisrylander.com.